Food Hunter's Guide to Cuisine: Have You Tried Cabot Cheese? Have You Tried Cabot Cheese? Calling all cheese lovers, I recently had the opportunity to sample a few varietals of Cabot Cheese blocks; Pepper Jack and the Sharp Light Cheddar. Both had a surprisingly soft smooth texture. The Pepper Jack had the perfect amount of spice and I must admit most of it was eaten sliced straight from the block, with a few pieces making their way into salads and sandwiches. The Sharp Light Cheddar had a great sharp flavor and didn’t skip on anything other than being half the fat. It boasts some impressive stats: only 70 calories per 1ounce serving, and 4.5 grams of fat. Founded in 1919, Cabot Creamery is a co-op, owned and operated by its members and dairy farmers located in New England and Upstate New York. They have a vested interest in providing the highest quality dairy products because 100% of their profits go directly to their family farmers. If you haven’t tried the “world’s best”, I highly recommend you find a store near you and pick up one of Cabot’s award-winning cheeses. After all, everything is better with cheese! This cheese is so good!! I can't eat cheese (gluten & lactose intolerance) but this is both gluten free and lactose free! It is so creamy and smooth. I've used it to make baked macaroni so many times. My favorite is the pepper jack. That is good melted over tortilla chips!!! I love Cabot cheese. I first tried it at least 25 years ago when we were stationed in New England. Still just as good now as it was then! I actually haven't tried Cabot cheese, but they sound delicious! I'll have to look for them next time I go grocery shopping! Yes, they have been around a long time with quality cheese! Yes, cabot is my FAVORITE. I love me some Cabot cheese, all of them are divine! I do love Cabot cheese! I even had some great samples recently at the Food and Wine Conf and met some of their team! I love Cabot! Try their greek yogurt too - it's the best! 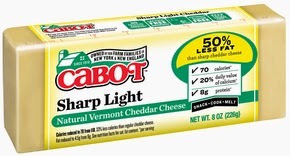 I'm a New England girl so we have Cabot cheeses all around us. I love Pepper Jack. Nice introduction to the brand. Thanks. I love their cheese. It`s quality which us foodies dig. Mmmmm. Cheese makes me happy! I'm a Cabot fan!! Cheese is one of the best things about living! !